The second of two workout mixes by Fina is still all about the guys! This boys night out-theme weaves its way through current faves by Ed Sheeran, Eminem, Nick Jonas and Rag ’n Bone Man. There’s even a triple shot of Bruno! 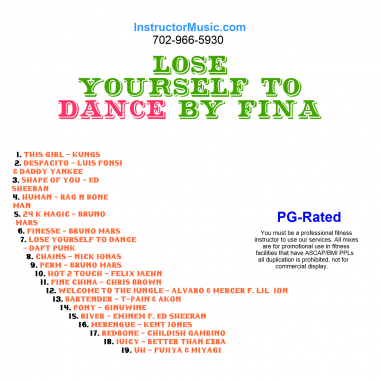 Other highlights include “Fine China”/CB, “Lose Yourself To Dance”/DP and “Bartender”/TP. This mix is PG-Rated.